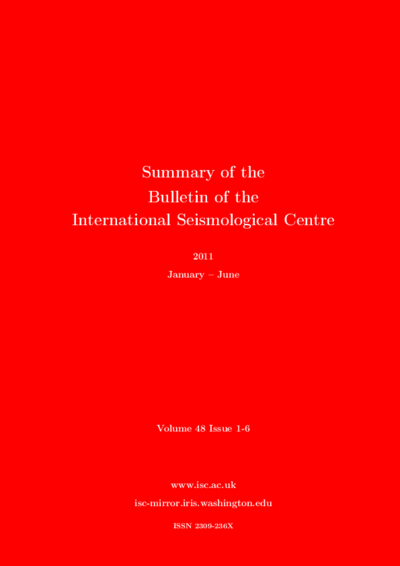 Volume 48, Issue 1 - 6 of the Summary covers data analysis on the first six months of data year 2011 including: Summary of Seismicity, Statistics of Collected Data, Overview of the ISC Bulletin, Leading Data Contributors. 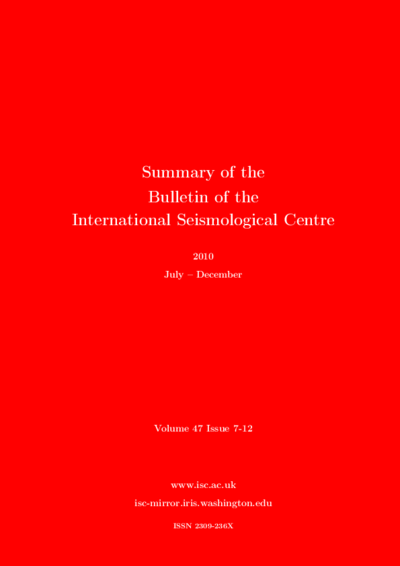 Volume 47, Issue 7 - 12 of the Summary covers data analysis on the last six months of data year 2010 including: Summary of Seismicity, Statistics of Collected Data, Overview of the ISC Bulletin, Leading Data Contributors. Volume 47, Issue 1 - 6 of the Summary covers data analysis on the first six months of data year 2010 including: Summary of Seismicity, Statistics of Collected Data, Overview of the ISC Bulletin, Leading Data Contributors. Published by the International Seismological Centre (ISC). For more information on the ISC, its mandate and other ISC products please visit www.isc.ac.uk. If your home-institution or company is unable to support the long-term international operations of the ISC in full by becoming an ISC Member, then, please, consider subscribing to this publication by visiting www.isc.ac.uk/sales/ or contacting us at admin￼ (at) isc.ac.uk.